Dive Journal: We met the Johnsons in San Diego after driving over from Phoenix the day before. We brought our road bikes, and I managed to melt the rear tire off mine during the trip (by placing it in the car's exhaust plume). Myron managed to blow out one of his station wagon tires as well, maybe due to the added weights and air tanks in the back. 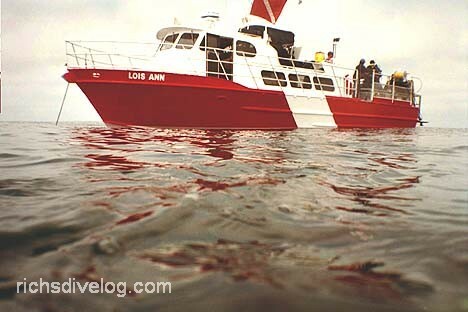 The Lois Ann launches from the main San Diego sportfishing marina and is a nice roomy 47' dive boat. The owners Larry and Lois Cochrane are dedicated dive industry professionals who seem to love their work. This is a very friendly dive boat. We motor south out of San Diego and apparently into Mexican waters. Finally reaching the Coronado Islands, Linda and I begin suiting up into our rented wetsuits. The thick neoprene is difficult for us to get into - Linda's suit is especially tight around the hips. Myron and I pick her up by the suit and try to sling her down into it, amid some onboard laughter. A giant stride off the boat leaves me gasping for air. There is no equipment problem - I am just unaccustomed to the colder water and I work to slow and deepen my breathing. Linda has the same reaction to the cold, compounded by the super tight suit. We descend to the bottom and head off for the southeast facing slope of the island. I rather dislike my soft weight belt - the lead-filled bags hang weirdly on my sides and they seem to shift my center of gravity whenever I change attitudes (not moods). Linda is noticeably perturbed about her weighting, and she seems to motion to Mercedes and me that her integrated weight pockets are snapping open. Mercedes reaches over and closes the open pockets on the rear of Linda's BC. OK? However, Linda motions again, and so I reach over and press the snaps again, making sure they are secure. OK? Linda seems a little exasperated at this and continues the dive. We finally understand that Linda feels overweighted and wants us to remove weights from the pockets, and so she keeps opening them but we keep closing them back up. The visibility is quite excellent. I was hoping to see a Garibaldi fish on this dive, and they are immediately evident in all forms (juvenile, young adult, and adult) all over the place! [I also want to see kelp here, but I later learn that there are better sights for that.] We also spot numerous large starfish and quite a few cucumbers. There are a good number of sea hares to be examined as well - very cool! The Lois Ann crew is very helpful with all my gear upon exit, and it's easy to get back on board. Still, with my skinny frame, I am pretty damned cold already. The hot chocolate, cookies, and fruits served taste especially good.